Irish women’s golf has gone through many ups and downs over the years but there has nearly always been a big star to keep things ticking over from a Philomena Garvey or Clarrie Reddan to a Mary McKenna or a Maureen Madill. Now, it seems, we have a plethora of top players including the world’s No 1 amateur in Leona Maguire. But it doesn’t stop there. The future looks bright and thanks to the efforts of the ILGU’s High Performance panel, we head into the height of the summer season with high hopes of making a winning impact on the international scene for the first time since McKenna, Madill, Clare Hourihane and Eavan Higgins were joined by the Wickham sisters Phil and Carol in winning the 1983 European Ladies Team Championship at Royal Waterloo. Thirty-two years is a long time ago, but there are compelling reasons to believe that Ireland’s women golfers can match the recent brilliance of the men, who won the Home Internationals last year and finished second in the Europeans to Spain. 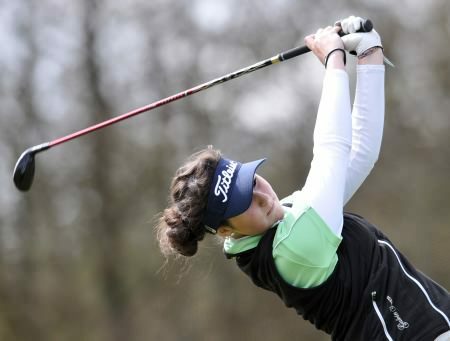 At least that’s the feeling Olivia Mehaffey has about her Irish team mates and the great strides made over the past 12 months and as she counts down to the European Ladies Team Championship at Helsingør Golf Club in Denmark from July 7-11. Quite apart from the obvious brilliance of Leona Maguire, Mehaffey has emerged as the next big thing thanks to three early season wins and last week’s run to the semi-finals of the Ladies’ British Open at Portstewart, where she fell to her future US college team mate, the Swede Linnea Strom. With seven of the 10 Irish entrants making the matchplay stages and three going as far as the last 16 —Ireland was the only “Home” nation to make that stage of the competition — we are clearly doing something right. "We have got a strong team this year - the Irish ladies, we’ve really stepped it up, and a lot of that is down to our High Performance programme,” says Olivia, who is destined for Arizona State University at the end of next year. The 15-strong ILGU High Performance panel now meets every six weeks with manager David Kearney and his team of expert coaches from fitness and nutrition specialist Robbie Cannon to psychologist Dr Lee-Ann Sharpe, physiotherapist Sharon Morris, short game and long game coach Chris Jelly and putting guru Donal Scott. Mehaffey has certainly reaped the benefits, winning the Irish Girls Under 18 Open Strokeplay for the third year in a row and then going on to complete a hat-trick of victories with wins in the prestigious Helen Holm Scottish Open Stroke Play and the Welsh Ladies Open Stroke Play Championships in successive weeks. She puts a lot of her success down to the fitness work she’s done with Cannon and that bodes well for the rest of the Irish team as we head into the meat of the season. . The same could be said for her fitness, which has improved so much under Cannon that she’s now hitting the ball high for the first time in her life. “Robbie is great and I honestly think that’s made the difference this year,” Mehaffey says of her fitness. “My ball striking is so much better. I am hitting it higher when it was low before and it’s make such a big difference to by ball flight. “I have been able to get on the inside and play a draw instead of always being over the top and low. Before I always hit over the top and I literally spent four years trying to stop and I couldn’t do it. Certain now to make the world’s Top 100 when the World Amateur Golf Ranking is updated at midday tomorrow (Wed), she’s determined to push and finish the season strongly for a change. “I always seem to start my season well and not finish it as strongly, so I am going to stay in top of everything and keep up with my practice and be more consistent this year," she vows. As for Portstewart, she says: “I think I’ll look back and I’ll be really happy. Right now I am disappointed because I was so close. But I went way beyond my expectations and Linnea is so good, I knew I had to play really well to beat her. She had a lot of birdies and she was really impressive. She was at a different standard really. The irish Ladies Close Championship at magnificent Rosapenna is next on the agenda for Mehaffey followed by the Vagliano Trophy match with Continental Europe at Malone. With Lisburn’s Paula Grant making it into the quarter-finals at Portstewart and with so many talented teenagers on the rise, including Junior Vagliano Trophy bound Mairead Martin from Killarney and Lurgan’s Annabel Wilson, the future looks bright for irish women’s golf. She might have some way to go to catch world No 1 Leona Maguire but Olivia Mehaffey can pick up her fourth title of the season in this afternoon's Irish Women's Amateur Close final at Rosapenna Hotel and Golf Resort. Olivia Mehaffey might have failed 5 and 4 to Sweden's Linnea Strom in the semi-finals of the Ladies' British Amateur Open but the Royal County Down Ladies star will overcome her disappointment to focus on finishing a stellar season as strongly as possible. She was in tears that her parents missed her moment of glory but Enniscrone’s Sarah Helly paid them the greatest tribute possible by using her sparking short game to clinch a shock win over Olivia Mehaffey in the Irish Women’s Amateur Close Championship over the Old Tom Morris Links at stunning Rosapenna.